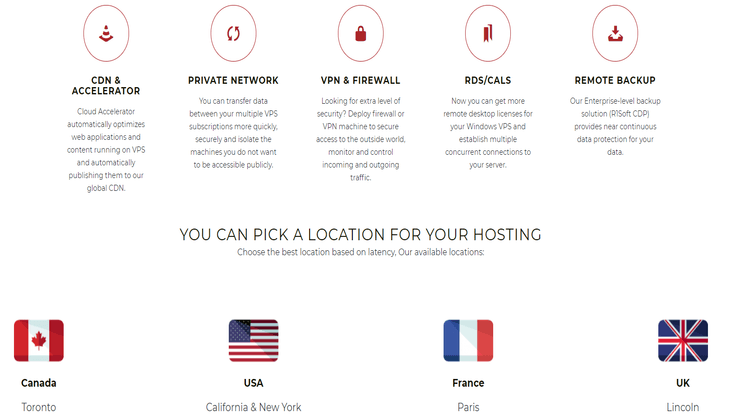 Cirrus Hosting Review 2019 - Solid Web Host But Are There Better Offers? Downtimes aren't a concern. Servers are stable. Support is efficient and live chat is available but ticket replies aren't as fast. Affordable to get started, but renewals are a bit more pricey. 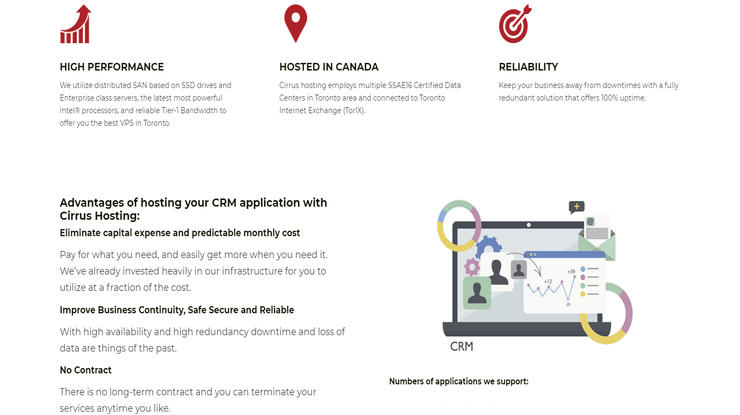 Cirrus is a leading Canadian web host, providing Website, VPS, Cloud, and Dedicated Server Hosting to over 100,000 business globally. Offering fully managed server environments and affordable shared hosting options, Cirrus is here to stay. One thing that we will continually be preaching about regardless if you are a small business, web agency, or solo entrepreneur is the need for a good web host in Canada. Cirrus provides an incredible amount of product services and customizable product options. They also provide a number of additional, supportive services like remote backups, SSL certificates, and domain name registration. Accepts CAD and USD - Cirrus Tech offers the option to pay using CAD or USD at checkout for all of their services. Simple client-focused practices give this web host a client-conscious touch. Multiple Datacenter Locations - With Datacenter locations in Toronto, New York, California, Paris, Lincoln, UK and Alblasserdam in the Netherlands, Cirrus Tech has you globally supported and a great infrastructure for CDN deployments. Green Initiatives - Cirrus supports keeping their datacenter and office locations green by utilizing energy efficient hardware and maintaining a paperless work office. Multi Control Panel Support - Cirrus offers support for both Parallels Plesk options for all of their products and cPanel control panel environments for some of their services. Website Builder - For clients that need a quick web presence, Cirrus offers an easy to use site builder and a 1-click WordPress Installer. Cirrus focuses very heavily on their VPS, Cloud, and Dedicated Server hosting options which are covered by their Plan I Managed Server service offering full instance support for core server services and processes. That same level of support and customer service is awarded to their shared hosting clients as well while being able to maintain competitive shared hosting prices. With 24/7/365 support through phone and ticketing systems, Cirrus clients have peace of mind that a technician will be available help if issues occur. 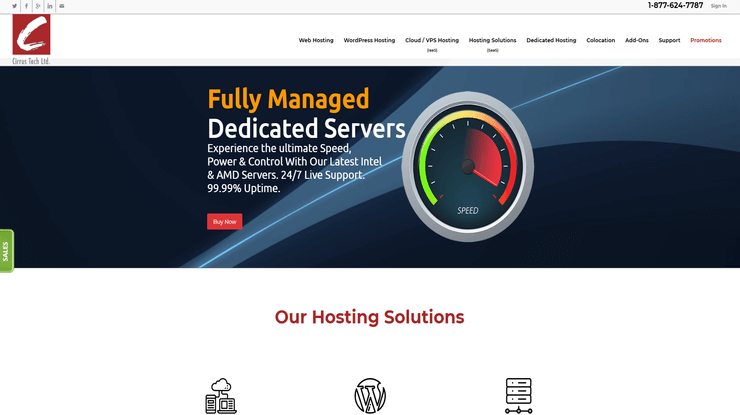 During our Cirrus web host review, the biggest stand out feature of this hosting provider is the amount options that they offer their clientele. Especially surrounding their Virtual Private Server and Dedicated Server Products. The VPS’s are highly scalable and resource efficient and the Dedicated Servers maintain a peak level of customization during the initial purchasing process and can be upgraded on a resource or tier basis with a simple ticket to the support team. In addition to the Private hosting options, there are Shared, Managed WordPress, SaaS hosting services and a 24/7/365 support team that can offer a free consultation to ensure you’re utilizing the right service for your needs. Cirrus provides a robust hosting infrastructure that stretches outside of Canada into four other countries. While their Dedicated Server products are relegated to their Ontario datacenter, Cirrus’s clients can provision VPS’s the US, France, UK, and the Netherlands. Emphasizing their capacity in recognizing client need, they expand globally while maintaining a focus on supporting their local business communities. Cirrus offers a literal buffet of hosting options and additional supportive services to enhance your hosting experience. We are particularly excited to see the inclusion of SaaS (Software as a service) options. This gives Cirrus a competitive edge compared to other, more generalized hosting providers as they offer managed application products that are in high demand like Accounting, CRM, and other popular application frameworks. 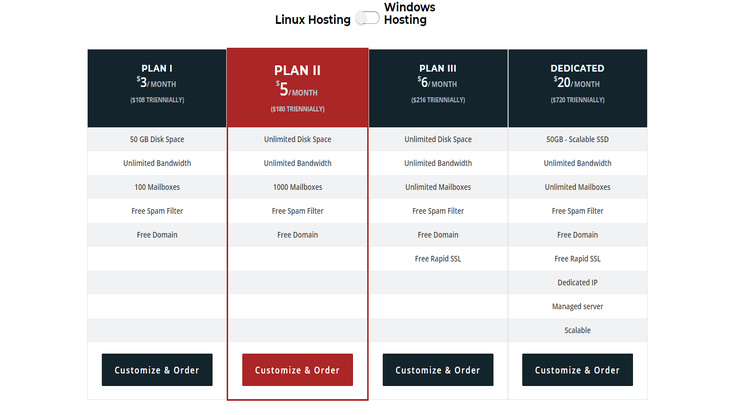 A nice touch to their available Shared web hosting Hosting options, Cirrus allows their clients to choose between using Windows-based servers or Linux based servers. A notable reason to use the Windows-based shared hosting options is access to an MSSQL database deployment if needed. This is incredibly useful for clients that need to have access to MSSQL but don’t necessarily need the freedom or power of a Windows VPS solution. Cirrus supports Linux and Windows Servers for their Shared Hosting product. 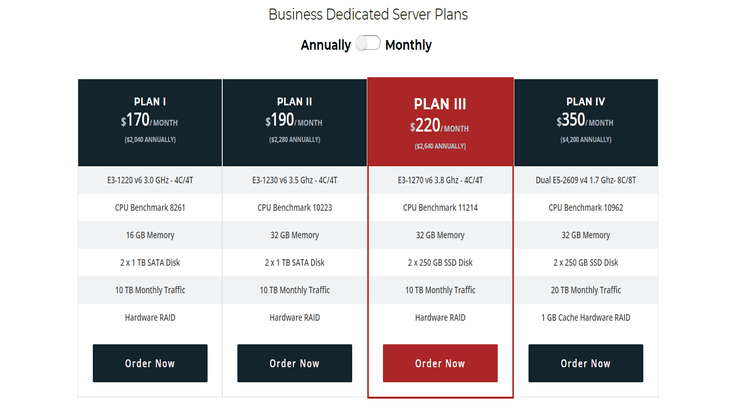 Further expanding on the customization niche that Cirrus provides, their Virtual Private Server options start with the Plan I at $10/mo and end with a plan IV at $80/mo. These tiers grow in resource allocation and available bandwidth, scaling with the client need. 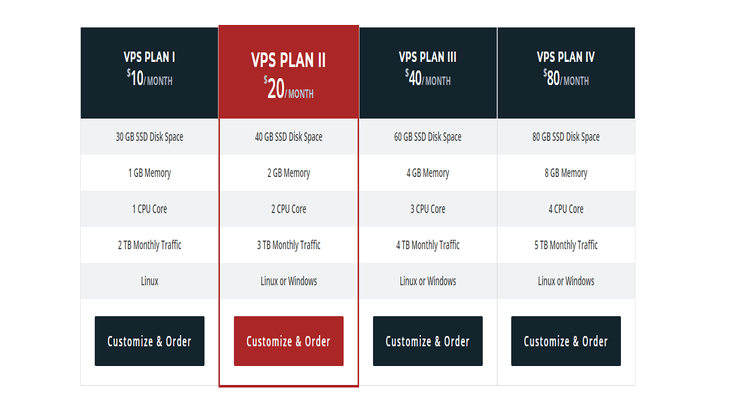 If a client needs to have a Windows VPS you will need to start at the Plan II. That is likely due to the disk allocation of Plan I being a little too small for a Windows install alongside other services. But, for that $10 increase, the Plan II product doubles the resources across the board. Acquiring a VPS product provides access to the Managed Server Plans. These are tiered support plans that allow a client to request support for deeper server and application support for their VPS’s and Dedicated Servers. If you are interested in one of those services, I highly recommend checking out the Managed Server Plans! Combining a VPS and Managed Server Plan can greatly enhance your hosting experience. When real server power is necessary, Cirrus answers the call with their Dedicated Server line-up. Starting with a Plan I at $170/mo, this server is allocated 4 CPU cores at 3GHz/core, 16GB of memory, and 2TB (2000GB) of SATA hard drive space. Maxing out the line-up with the Plan VIII tier at $1230/mo, you will want for nothing. This powerhouse server is allocated dual Xeon 10 core CPU at 2.4GHz/core, 256GB of memory, and 4TB (4000GB) SSD in Raid with 8GB cache limit. For their premium line-up, Cirrus brings versatility and power to help their client conquer previous hosting limitations. Something that we don’t see too often anymore is a hosting provider supporting colocation deployments. Colocation is a method of allowing a client to physically move a server to a data center to be managed remotely but the hardware is owned by the client instead of the hosting provider. Software as a service is nothing foreign to a hosting provider but having a list of applications that are directly supported and managed by a hosting company is kind of a new idea. Cirrus supports a number of SaaS solutions. 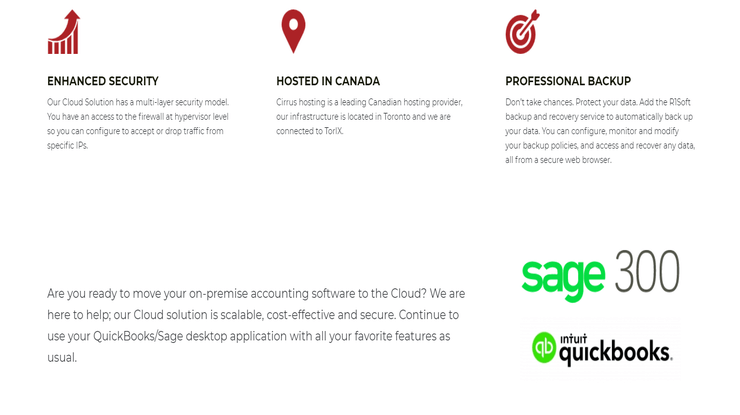 Accounting software like Intuit’s Quickbooks and Sage 300 can be supported remotely with increase security than a local server instance and managed with peace of mind as these solutions have access to backups services to keep the data safe. Choose between Small Business and Managed Small Business options. Customer Relationship Management software is becoming more and more a staple of running a successful digital age business. Clients using Microsoft’s Dynamics CRM, Sugar CRM, or Sage 300 can spend less time maintaining their application and allocate more time growing their business and keeping their customers happy. Giving your CRM software an increase in performance and reliability can ensure prosperous years to come. Choose between Public and Private Plan options. Cirrus Tech is a strong contender for clients looking for options or needing to customize their solutions with a fine tooth comb. By providing access to multiple data center location, a ton of product services, and tiered managed Server plans, Cirrus clients can fully craft their perfect solution. If the options feel overwhelming just reach out to their customer support team for a consultation and narrow down the option to the best fit. Drawing our Cirrus Tech LTD hosting review to a close, we would like to emphasize the importance of customization and product options. Allowing clientele to have access to really customize a perfect solution has an enormous amount of value to the right customer. Yes, some clients may only need a simple shared hosting solution for $3/mo, but there are definitely clients out there that need more control and freedom to craft a hosting solution that is truly the best possible fit for their application, website, or multi-server deployment. Cirrus is just the web host those clients need. So reach out for a free consultation and start building your perfect solution.